Another part of my LENTEN observance involves drinking. Forty days and forty nights of alcohol abstinence. Do I have a drinking problem? I don’t think so. Denial is difficult to overcome when nowadays the definition of alcoholism is so varied. I have not had a glass of red/white wine, a vodka martini with three olives, double bourbon on the rocks in twenty-six days. Having two glasses of wine a night was a norm with the occasional martini/bourbon drink on the weekend. With the drinking, came the munching of cheese, salt, chocolate or whatever food complemented the drink at hand. It has not been easy to not drink alcohol. Social outings have diminished as most of the people I surround myself with drink. Then again, most of the people I surround myself with drink alcohol at bars. Social drinking is social drinking. We drink and socialize. Could we socialize without the drinking? Probably. The glasses of wine I looked forward to after working an emotionally and physical shift are gone. Now I drink hot chocolate or chamomile or ginger tea. I no longer sit in front of the TV watching SVU re-runs, munching on bags of chips as Stabler and Benson solve a case. My class work is done on time and I actually retain the reading assignments. What happens after forty days and nights of abstinence from alcohol? Will I return to old habits or is this experience a wake-up call towards better health. The Four Agreements are four sentences, written in simple words, but simple does not describe the act of putting into practice on a daily basis, what those sentences contain. Gossip seems to be a cultural norm and almost impossible to avoid. There is gossip at my church, gossip at work, gossip at home, gossip running into neighbours. Some gossip is good and positive while most is downright ugly. I feel guilty when I indulge in the ugly gossip, miserable after I participate in it and ready for confession to purge my guilt after listening to it. I speak against myself all the time. It is an everyday occurrence between me, myself and I. Rarely do all three agree except when doubt, self-esteem, finances and negativity issues come to the surface. Then it’s a fiesta! Truly a hard one as I take everything personally! I try to please, all the time, with people and especially animals. If someone is negative towards me, I chastise myself. That someone of negativity is not blamed for something I probably did to warrant that kind of treatment. We are a country of assumers and you know the saying, “When you assume you make an a** out of you and me…”. ‘Nuff said. Assumptions lack clarity. It is easier to assume than to strive for clarification because one avoids confrontation and there are those who would rather face plague than confrontation. This, I must pay attention to, as doing, my best is always 150% and I am treated often as if it were only 10%. (That’s another topic to cover in the future dealing with race-Your 100% = My 150%) Always doing my best is just that-doing my best, not more, not less, just what is needed to the best of my ability. A hard agreement to put into practice but worth it when done. Part of my Lenten observance is adherence to three themes and the Four Agreements offer an opportunity to combine the themes with a practice. Contemplation, Action and Resolve are in relationship with the Four Agreements. Examination of one’s’ past in order to move forward with understanding is a requirement. Action is placed in motion through understanding how past actions affects our present thoughts. Resolve is reckoning and moving forward with a new perspective. 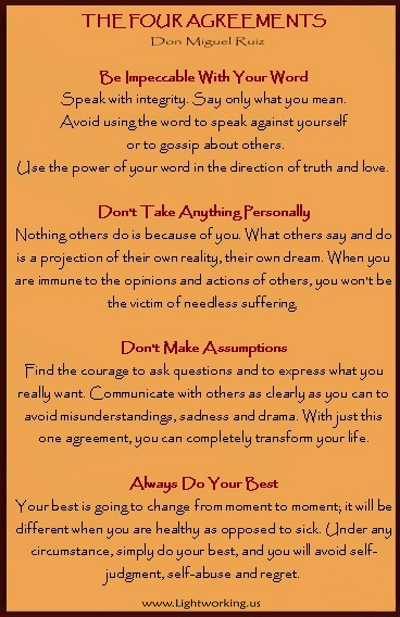 There is a much deeper level towards interpreting and understanding the four agreements and the effects on ones’ life. This entry was my interpretation.